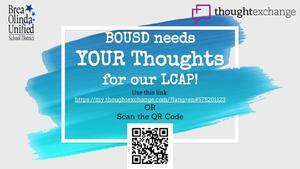 As part of our annual Local Control Accountability Plan (LCAP) we are asking our families, community members and students to weigh in on critical priorities and funding decisions. The LCAP is part of a statewide effort to raise achievement, boost equity, improve school climates and increase accountability through greater stakeholder engagement at the local level. 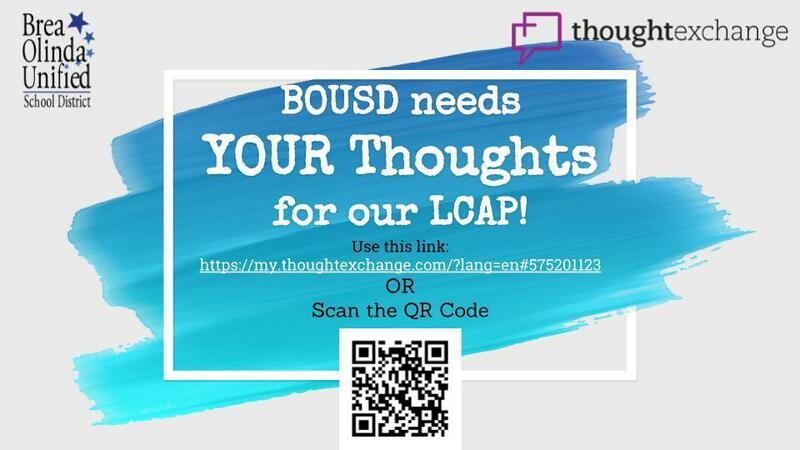 To increase the depth and breadth of stakeholder voice, we are asking you to engage and share your thoughts about our District in our Thoughtexchange. Click on the links below to engage in our Thoughtexchange or scan the QR Code with your mobile device to be taken directly to the Exchange. Our ThoughtExchange will be open from January 15 - February 28. Want to learn more about LCAP and our District Funding process? Please click on the link below to watch the video.